Who is a non-religious LGBT elder? According to a Pew Report from 2013, the LGBT older adult population includes a significant portion of those who do not attend religious services and may identify as atheist, agnostic, non-believer. This group may include those who have left a faith tradition after being rejected by that faith. Even among those who still attend services, many do not share their sexual orientation or gender identity out of fear of rejection by parishioners and clergy. Some may attend religious services with family on occasion while leaving their identity, and reasons for falling away from the rituals, undisclosed. It is not surprising that many non-religious LGBT people reject seeing a chaplain, assuming that all chaplains represent a religious community with which they may have a damaged or stressed relationship. Nevertheless, as life situations evolve, spiritual care may be needed and even sought out by the LGBT elder, albeit cloaked in another form than seeking standard religious practice. Meeting this need requires creativity and individualized spiritual care. Coming out to the LGBT person as LGBT or an ally. Many chaplains have had training in relating to the LGBT culture. Some identify on the LGBT spectrum themselves. It is important for chaplains who are familiar with and accepting of people in this community to find ways to communicate their support. Some wear a rainbow sign on a name badge, or mention something that is likely known to people in the LGBT community, such as a Pride Parade or a contemporary movie that contains positive LGBT content. 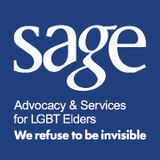 LGBT elders look for signs about who it is safe to come out to and discuss the realities of their lives. Even if not LGBT themselves, many elders have family members or friends who are LGBT and may find it helpful to process their feelings and experiences with a chaplain who they know will be respectful of their community. Keep in mind that these sensitive conversations require a high bar of confidentiality, and the content of these conversations should not to be shared with others unless you are given permission or there is a compelling reason impacting the elder’s health or well-being. Offering the elder a referral to a trusted and LGBT-vetted colleague is appropriate if you feel it will benefit the elder, and you may consider keeping a referral list of chaplains who “speak the same language” as LGBT elders. Referrals should only be made with the elder’s permission. Engaging spiritually with the non-religious LGBT person. Many LGBT older adults grew up in a religious home but left their religion when they discovered their church, synagogue, mosque, sangha, or other tradition’s position on LGBT people and identities. This separation was often a painful, even traumatic, rupture; yet many remember the prayers and rituals from their childhood. Without needing to know the particulars of these early religious experiences, chaplains can relate to the non-religious elder in spiritual terms by using a “meta-language” of personal meaning and of connections to things greater than themselves. Using language that addresses spiritual concerns but is not tied to specific traditions can help you provide comfort for elders needing spiritual care and comfort. Narrative spiritual care can also be a useful tool. With elders who find resonance with biblical texts, the chaplain can make connections between the elder’s situation and familiar biblical texts. For example, the love between David and Jonathan, and between Ruth and Naomi, can be used to open up a conversation about the depth of their same gender love. For more existential questions of spiritual anguish and longing, Psalm 42, “as the deer long for flowing streams, so my soul longs for you, [Oh God]…deep calls to deep”, may be comforting. A wealth of poetry has been written from the LGBT perspective and experience that can be reassuring of the validity of love, self-acceptance, and being one among many in the larger LGBT community. May Sarton and Mary Oliver, both lesbians, are two such poets. Thich Nhat Hanh in his many writings on Buddhist mindfulness offers ways to tap into the depth of one’s own being—in fact, there are meditation sessions in many locations specifically for the LGBT community. Some chaplains borrow from these meditative practices to offer a cognitively intact elder a spiritual practice toward personal peace. Sometimes spiritual care is capturing a moment of transcendence, such as a sunrise, a magical moment with another, or an unexpected synchronicity. Mutual awareness of these moments for the LGBT elder and chaplain may offer a springboard to a discussion of benevolent forces beyond oneself. Relationships. Offering one’s authentic self in the spiritual care relationship is often a primary tool in spiritual care. This takes courage, intuition, and skill on the chaplain’s part. The focus is always on what the elder needs and is looking for in the interaction. When the elder has found the message they need, the chaplain can let go of further expansion from the sources, and relish with the elder the comfort they have found. Sometimes a spiritual care relationship can feel like companioning the elder through their valley of the shadow, out into the light of universal love. – is there a way to make this more LGBT specific? Planning for a visit. Planning ahead for a visit with poetry, music, or literature that reflects the elder’s experience is helpful. For example, if you are working with a transgender elder, bringing poetry or writing by other transgender people, and, if appropriate, a symbolic reference from the elder’s religious background, can provide healing tools to draw from in a visit. Connections to the wider LGBT community. The LGBT community is often one of the spiritual resources of an LGBT elder. Toward the end of a spiritual care visit, thinking about where the elder is in terms of their place in the larger LGBT community can be important. If the elder wishes to strengthen their connection and activity within the LGBT community, the chaplain can assist with this connection by providing referrals to LGBT supportive programs and groups. 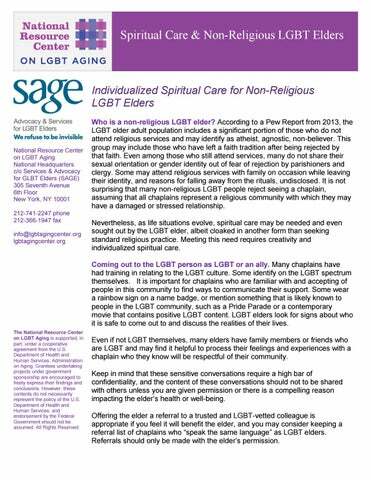 This fact sheets discusses ways chaplains can provide spiritual support and resources to non-religious LGBT older adults.